Until a couple of years ago, I had never heard of Gary Bertini. Then I stumbled across a copy of his long-deleted Mahler 4 in the City of Sydney public library and, Mahler addict that I am, borrowed it to compare with the umpteen other versions in my own collection. It compared very well. Bertini showed himself to be a master of long singing lines and fine orchestral balances. So impressed was I, that I bought his Mahler cycle on its re-release by EMI earlier this year. Bertini was an Israeli conductor whose family migrated to Israel from the USSR in the 1930s. He built his career first in Israel, then in continental Europe and finally in Japan, where he was much loved. Now, a year after his death, Capriccio has launched a Gary Bertini Edition, featuring live performances from the archives of the Kölner Rundfunk-Sinfonie-Orchester, of which Bertini was chief conductor for nine years from 1983. It was with this band – now known as the WDR Sinfonieorchester Köln – that Bertini recorded that excellent Mahler cycle. In more recent times, this same orchestra recorded one of the great Shostakovich symphony cycles with Rudolf Barshai (see reviews 1, 2 and 3). Anyone who knows those recordings will have a lot of respect for these musicians, who play with a clean orchestral sound and excellent part definition. The brass are a particularly impressive bunch and, on this disc, the strings really sing. 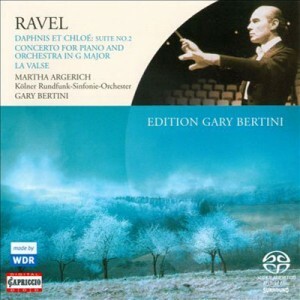 This all-Ravel collection is a worthy memorial to a conductor who is deservedly winning more fans. It opens with a gorgeous wash of sound for Daphnis et Chloé. The high violin lines in the Pantomime movement may not be perfectly pure in tone, but this reservation is minor. The solo flute in the same movement is alluring and the orchestral playing generally seductive. There could be more snap in the opening of the final Danse, but what the finale lacks in sheer abandon it makes up for in polish. The German engineering is also immaculate, a slight tendency to spotlight instrumental solos notwithstanding. The performance of Ravel’s jazzy, Gershwin-esque piano concerto is also well worth hearing. This is not Argerich’s first recorded performance of the piece. Just a year before this live event was taped, she had set down her second interpretation for Deutsche Grammophon with Abbado and the Berlin Philharmonic. This performance is cut from similar cloth. There is more flexibility to Argerich’s playing here than in her earlier 1968 account, and literalists will be displeased. Argerich’s fans, however, will revel in the fantasy of her playing and be moved by the hushed intimacy she brings to the central movement. The orchestra is again vividly caught. The final performance is just a little too much of a good thing. There is absolutely nothing wrong with the playing in this performance of La Valse, but there is a muscularity and a slight brutality in Bertini’s interpretation that push this gentle parody of old Vienna into the realm of sarcasm. Look to Boulez on Sony for a more idiomatic rendering of this gorgeous piece. Minor reservations aside, this is a disc for fans of Argerich, fans of Bertini and fans of Ravel to consider.